Christmas is only a few days away – not a lot of time to plan an RV Christmas Road Trip. But the beautiful thing about Christmas is that it comes every year! Why not plan an adventure for next year to one of these unique Christmas-themed destinations? That’s right – there is a town in Indiana called Santa Claus, and you can stay at the Lake Rudolph Campground & RV Resort! Twice named the National RV Park of the year and one of the top 10 best campgrounds for families by TravelChannel.com, Lake Rudolph has amazing amenities, like a Christmas-themed waterpark! Santa Claus – the town – also has the Santa Claus Museum, Santa’s Candy Castle, and Frosty’s Fun Center, making it an ideal place to bring the kids. The holiday spirit is right there in the name! Why not celebrate Christmas in Christmas! The weather might be hot, but that doesn’t mean it’s light on Christmas spirit. The RV park has a giant Christmas tree, Santa, and sleigh. You can also take a quick day trip to Disney World or Legoland and experience Christmas joy there. 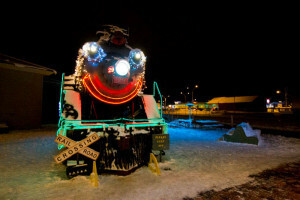 It doesn’t sound like a Christmas destination, but the Grand Canyon Railway transforms into the Grand Canyon Polar Express at Christmas time. On the ride, each kid receives a special gift on the way to the North Pole and Santa. You’ll also get some of the best views of the canyon at this time of the year, as well as an opportunity to see some wonderful winter wildlife. There are plenty of beautiful RV parks around and so much to do. Christmas is so often a time to stay home and be with family. But home and family can be anywhere – why not one of these places?